X10 is a power line and RF based technology developed in the 1970s. It's very susceptible to signal interference from other devices on the power line because the protocol doesn't support command acknowledgement or 2-way communication. This makes it a fairly unreliable technology. Couple this with the fact that the company that originated the technology has gone bankrupt and in our opinion it's a risky option to build new systems with. Use a plug-in transceiver (V572AB, TM751, or EZX10RF) which receives RF signals and then transmits corresponding X10 signals down your power lines to the X10 power line interface (CM11, LynX-PLC, PowerLinc) connected to Indigo. Using a RF to power line transceiver results in an additional delay between the RF signal and Indigo's reception of the signal. This delay occurs because the transceiver has to broadcast the X10 signal down the power line to the X10 power line interface before Indigo can receive and trigger actions based on the signal. Use a RF Receiver Interface (W800USB, W800RF32, MR26a, or CM15A) which receives RF signals and then directly sends them to Indigo. When using the RF Interface, the RF signals are sent directly to the computer (no signals need to be transmitted down the power line) resulting in a more responsive control system. Because both the W800RF32 and MR26a are serial devices, you will need a USB serial adapter to connect either one with your computer. If you are using the W800USB, it has USB built-in, but it requires the same FTDI driver as mentioned in the Getting Started Guide for the INSTEON and X10 Interfaces so follow those instructions for installation. The ActiveHome Pro (CM15A) uses USB and does not require a USB serial adapter. 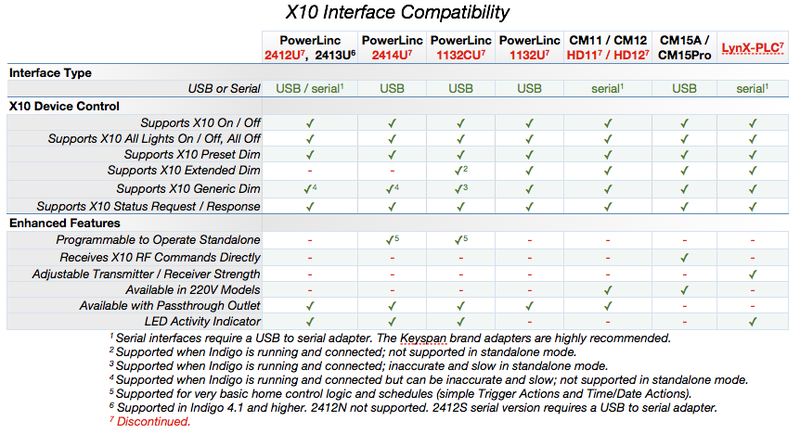 To use any X10 power line device, you need an X10 computer interface that allows your Mac to send and receive commands from X10 devices via the power line. Currently shipping X10 interfaces that Indigo supports are the PowerLinc 2413U from INSTEON and the CM15A (aka CM15Pro). Indigo also supports several discontinued interfaces as well (CM11/CM12, HD11/HD12, Lynx-PLC, PowerLinc 1132U/1132CU, PowerLinc 2414U, PowerLinc 2412U). See the Connecting INSTEON and X10 Power Line Interfaces section of the getting started manual for details. Once you have your interface connected to Indigo and configured properly, you can then start adding X10 devices.